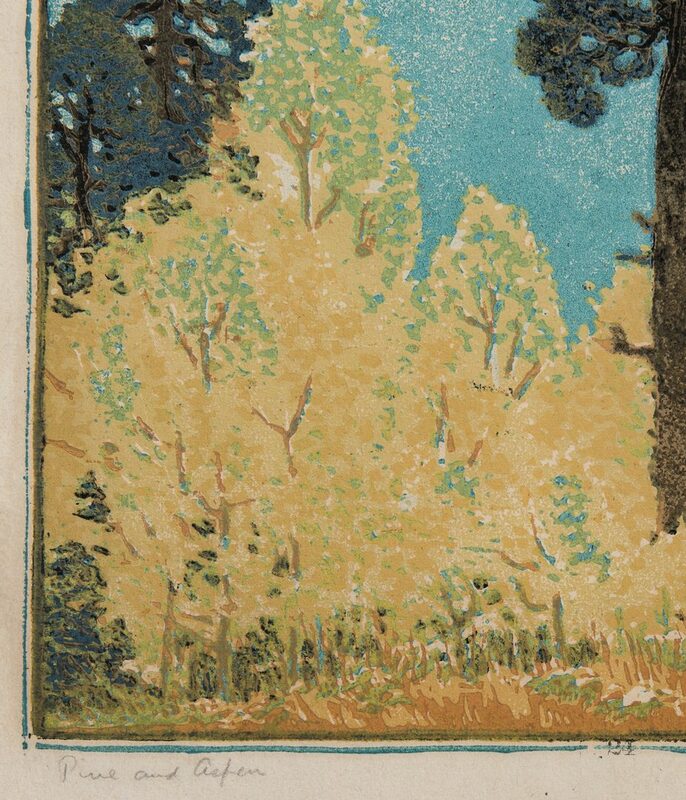 Gustave Baumann (New Mexico/California, 1881-1971), “Pine and Aspen,” color woodcut on cream Zanders laid paper, depicting dark green pine trees and aspen with yellow foliage against a blue sky. 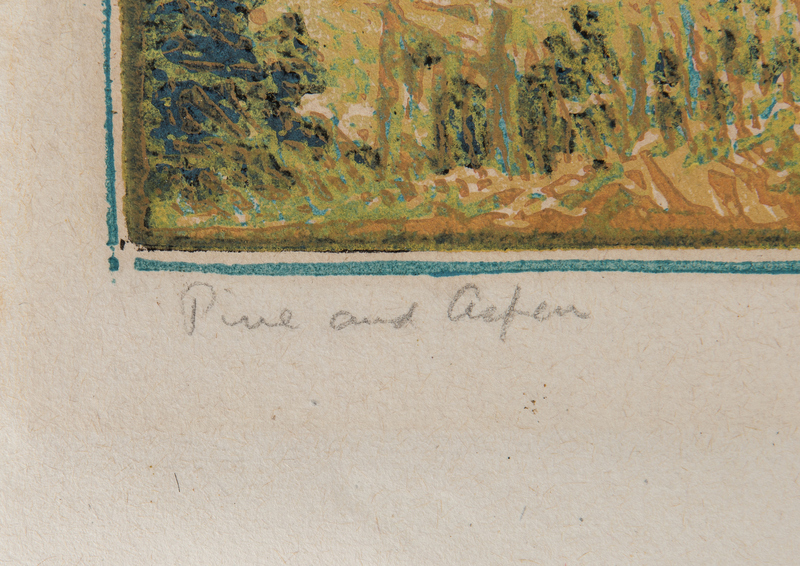 Titled in pencil lower left, stamp numbered “24” lower center, pencil signed with artist’s red hand-in-heart artist’s stamp lower right. 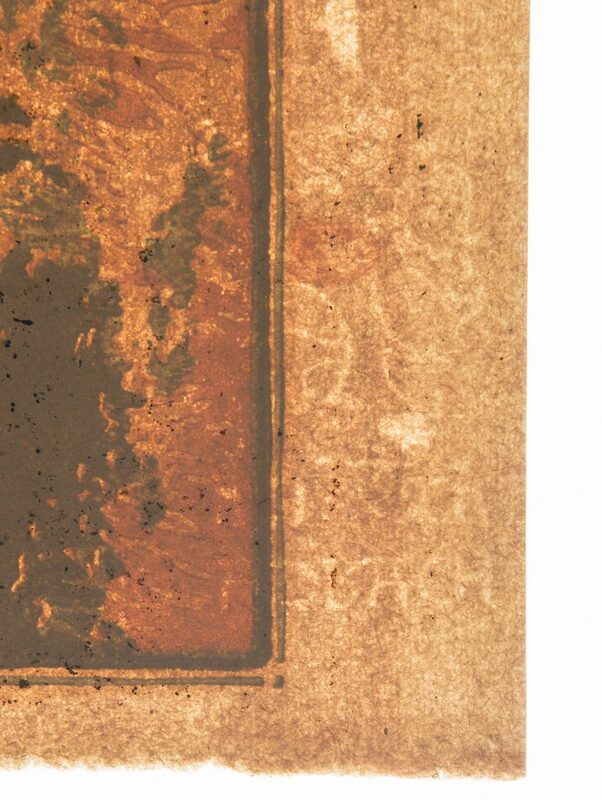 Bergisch Gladbach watermark lower right. Sight – 14″ H x 13 1/2″ W. Framed – 21 1/2″ H x 21 5/8″ W. Created in 1920. Biography: Born in Magdeburg, Germany in 1881, Baumann’s family moved to Chicago in 1891. 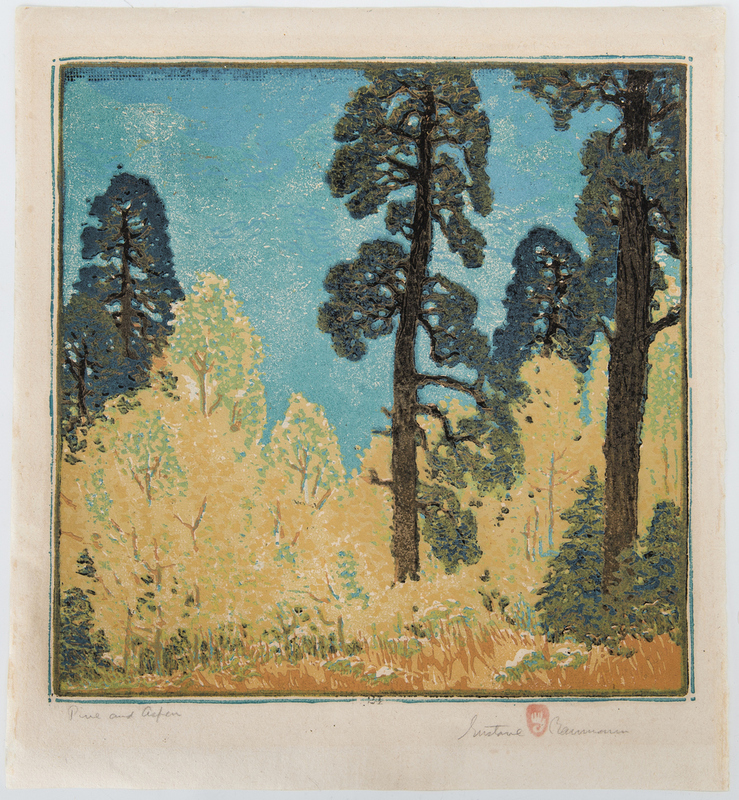 He studied at the Art Institute of Chicago and later at Kunstgewerbeschule in Munich where he studied under Maximilian Dasio (1865-1954), a painter who experimented with linocuts, and Hans Neumann (1873-1957), a woodcut artist, and learned both techniques. 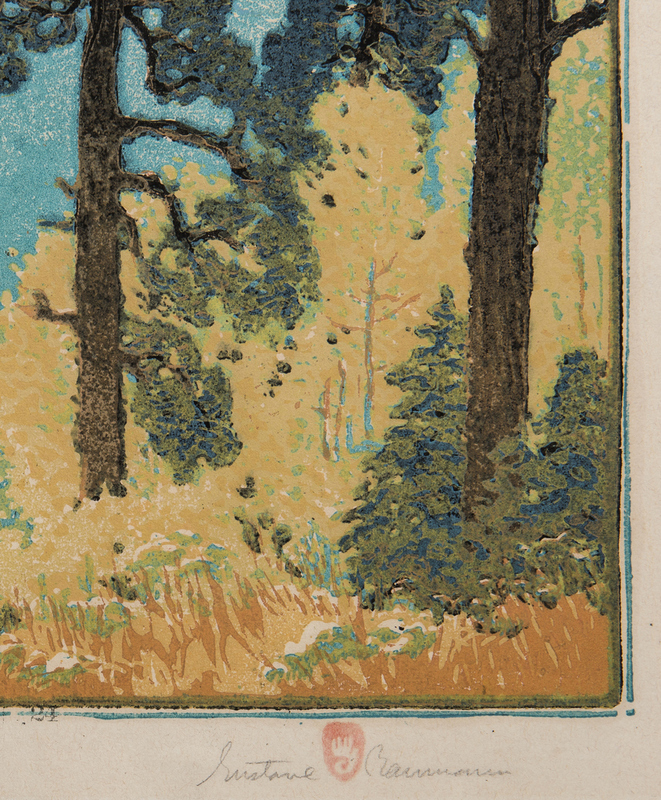 In addition to Chicago, Baumann traveled extensively throughout the United States, living in Brown County, Indiana from 1910 – 1917 where he created “In the Hills o’ Brown”, a portfolio of twelve four-color woodcuts. He eventually settled in Sante Fe, New Mexico where he lived for over 50 years. 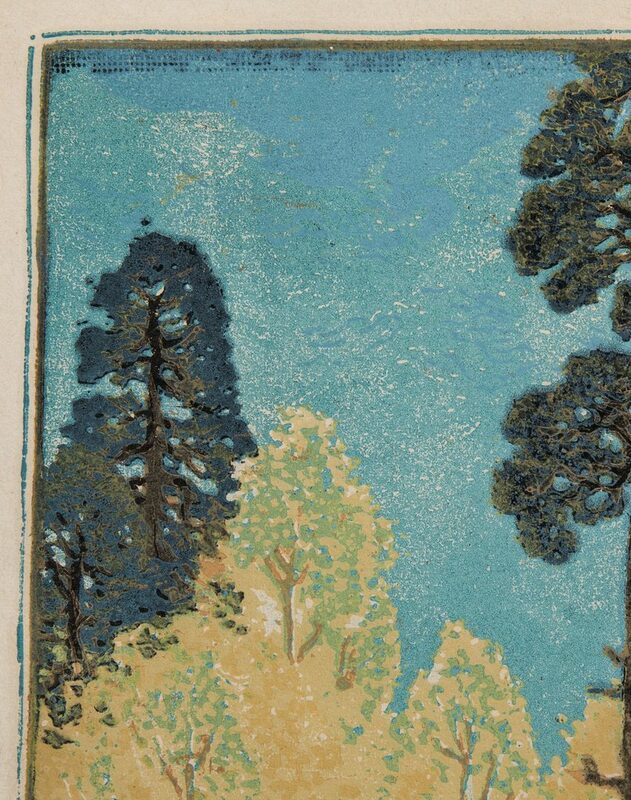 He travelled to California several times and created a series of eleven woodblock prints of California scenes. 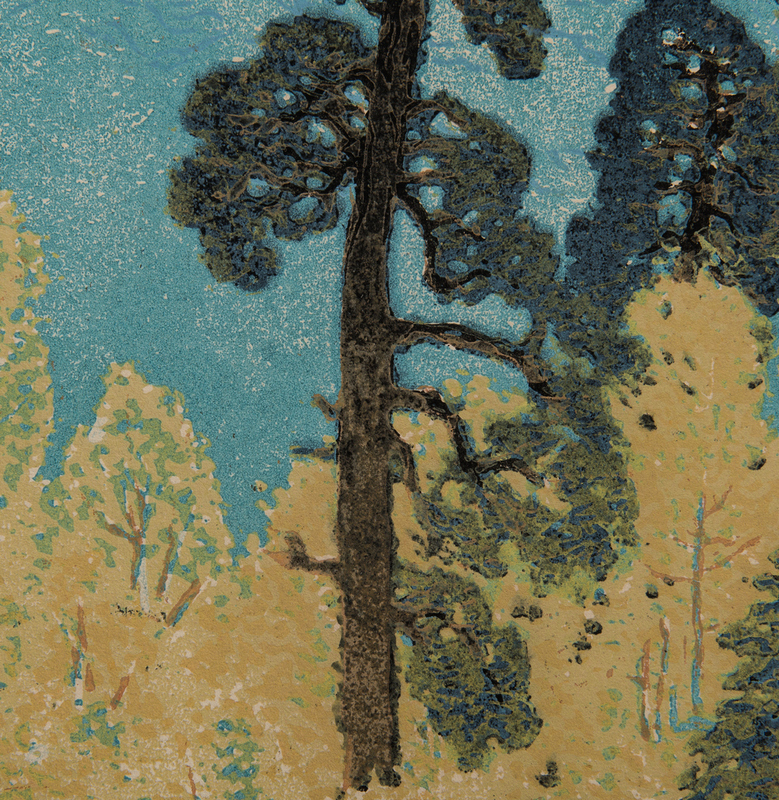 He was very active in the Santa Fe area community and was the WPA co-ordinator in Santa Fe during the 1930s. 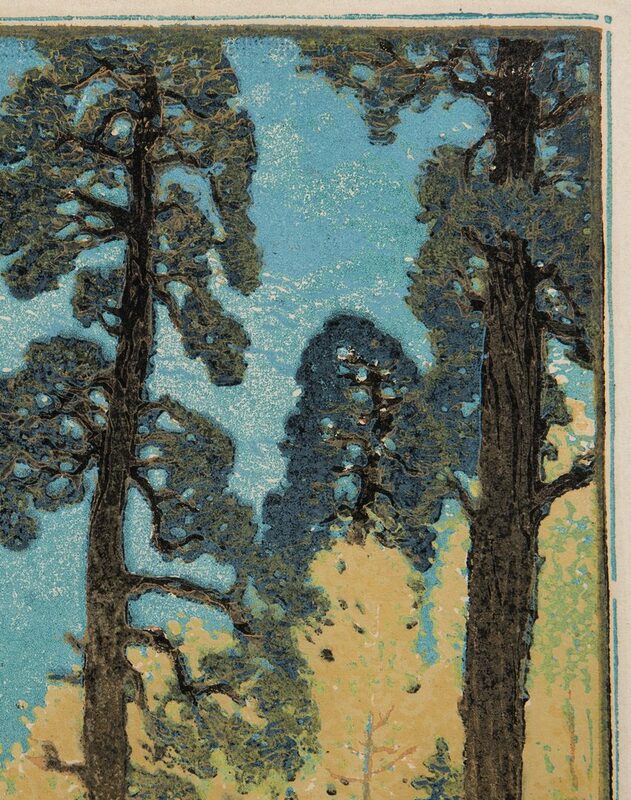 His works were exhibited at Panama-Pacific International Exposition of 1915 where he won a gold medal and at the Los Angeles County Museum of Art in 1926. 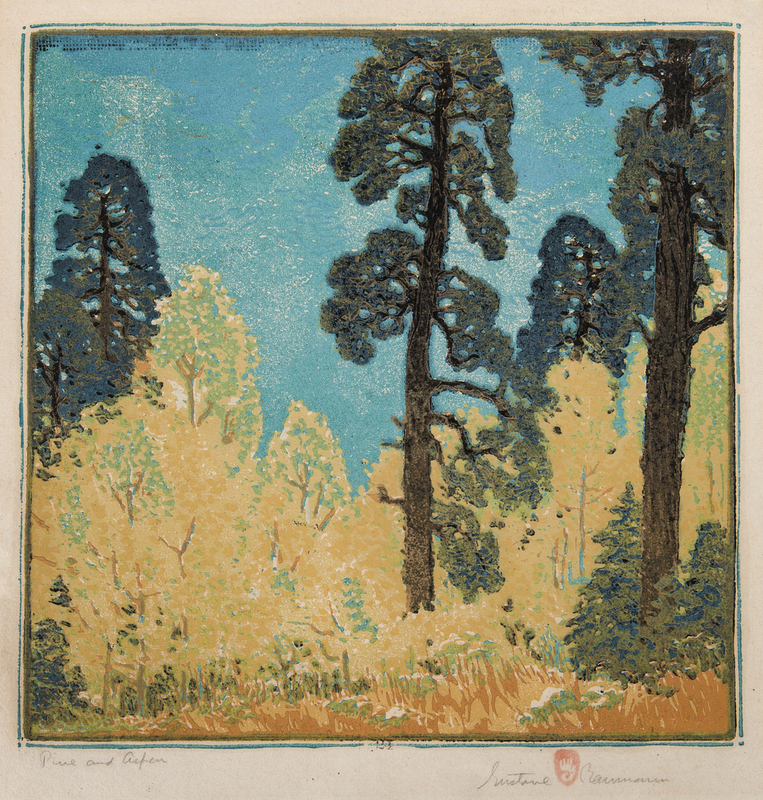 A printmaker and painter, Gustave Baumann is known for his colorful woodblock prints, particularly his landscapes depicting scenes in New Mexico, the California coast and life in Southwestern pueblos (Source: Fine Arts Museums of San Francisco). CONDITION: Professionally conserved. 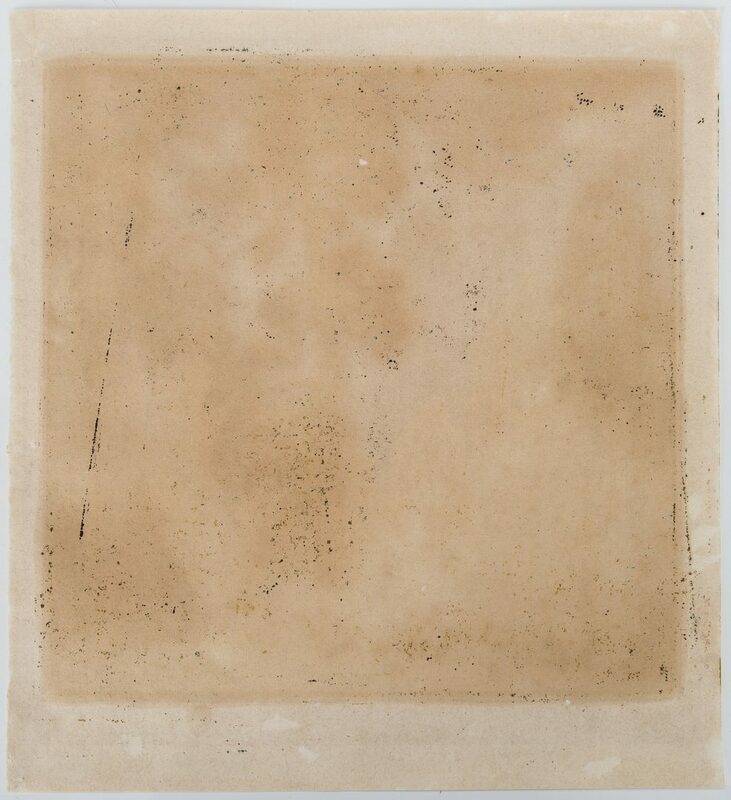 Removed from old acidic mat and mounting. 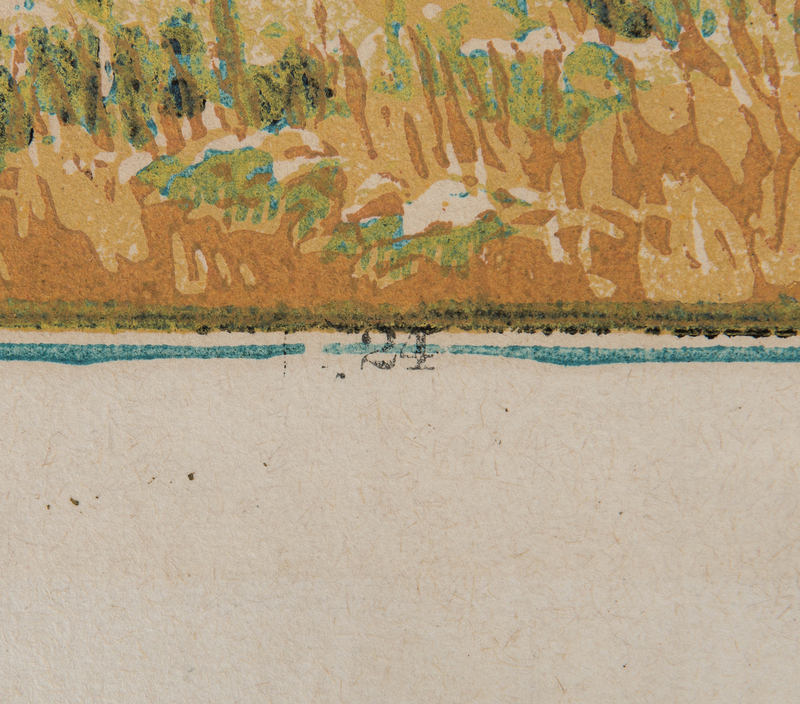 Old glues were removed from back of print and removed from the front margins. Print was washed, deacidified and returned to plane to reduce mat burn and acidic darkening.